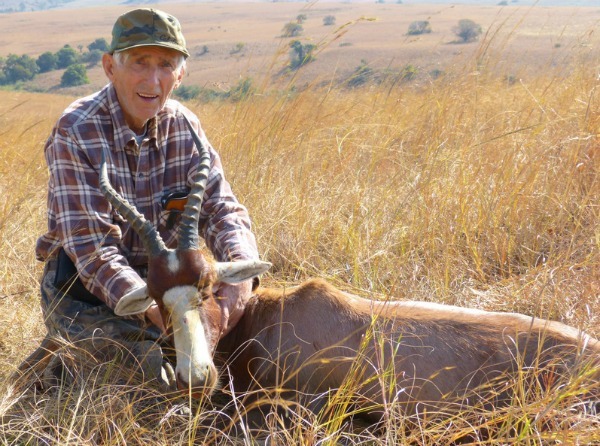 Duane Wakeman with blesbok taken in South Africa in 2013. Photo by Randy Wakeman. My Dad loved a great many people throughout his life. In particular, he had a very close, special relationship with my great-grandfather, George Chamberlain Wakeman. When I was a young boy, whenever my Dad and I were out doing things, at the end of the day Dad always made it a point for us to stop by and have a good visit with his Grandpa (and my great-grandfather). Great-Grandpa was a very cool guy, I can tell you that. Great-grandpa provided for his wife, three boys and daughter by farming and commercial hunting. When he finally got his first two used tractors, they replaced the horses with which he had previous worked his farms. Along the way, great-grandpa was an exceptionally talented musician and personally assembled the largest private collection of American Indian artifacts in the State of Illinois. I didn't have to read how it really was in the old days, before electricity and refrigeration were common. All I had to do was ask Great-Grandpa, for he was there. Dad never stopped loving his grandfather. My godparents were Irma and Augie Wolfe. They were a one of a kind couple and my parents, Irma and Augie, were fabulously close, loving friends throughout their lives. Augie was beyond exceptional, for he was the kindest, most unselfish, sincere, unpretentious individual I have ever known. I'd be out with Augie in his old truck and Augie would spot a broken fence out in a field. Moments later, we would be out in that field and I would be handing Augie wood and nails, and the fence got fixed. Who knows who owned the fence? No one did. After the repairs, I would ask Augie why we did this. Augie just smiled and said, "That fence needed fixing." That's the way it was, an event that repeated itself countless times. Whenever Augie saw something that needed work and repair, he just dropped what he was doing and did it, solely because it needed it. Rarely was anyone the wiser, for all kinds of things just got repaired, fixed, and mended mysteriously for years because they needed it, no other reason. Dad never stopped loving his Grandpa Wakeman, nor did he ever stop loving Irma and Augie Wolf. Though they are long gone, in a physical sense, they are not actually gone. If you truly love someone, they are forever a part of you in your heart, your soul and your mind. That is they way it was with Dad, great-grandpa and Irma and Augie. My Dad's primary interest throughout his adult life was Eunice Ethel Nordmeyer. I have no idea how many cans of alphabet soup you would have to consume to come up with that name, but I suspect it would be more than a couple of handfuls. There was a lot more going on than just the snazzy name, to be sure. My parents were married for sixty-three and a half years. After the first sixty years, even I got the impression that things were probably going to work out between those two lovebirds. It was convention for many years for Dad to have work car, a real stripper. For some time, it was a white Ford Falcon, three in the tree transmission, manual steering, brakes, windows, manual everything. Then there was Mom's car. The family car, a nicer, roomier car that could handle Mom, Dad and five kids. Years ago, we were on a hunting trip, but a then-new Ford Pinto station was the only reliable vehicle available and all the boys were along. Dad sometimes liked to take his version of short-cuts. This time, one of his many shortcuts was a washed-out logging road well populated with rocks in the center that were more like boulders. Every time a boulder smashed into the frame of the car, Dad gushed, "It isn't that bad." I was forced to mention that, "Dad, it is not only 'that bad,' it is far worse." Far, far worse. I have never seen a new car completely transformed into a pretzel in one afternoon, but this is as close as it gets. I mentioned to Dad that the only satisfaction of this is, "the gas tank will probably fall off before it has a chance to explode." Most of the exhaust system and other assorted bits were long gone. After Dad realized that Mom's car was soon to be a historical footnote of twisted junk, he said, "Don't tell your mother! Don't tell your mother! Whatever you do, don't tell your mother!" We did, in a borderline miraculous fashion, actually make it out of the woods that day. Dad swerved into the first gas station he could find, but not for gas. He got a bag full of change and hit the pay phone. After the call was connected, the very first words out of his mouth were, "Eunice, I just wrecked your car." Several years back, we were on an elk-hunting trip, fourteen miles or so through the mountains of the Bob Marshall Wilderness by horseback. Dad had read where wearing womens' hosiery was good for a trip like this, so he borrowed a few pair from Mom. After finally making it into camp, the ripped up, drafty canvas tents were raised. I split a smaller tent with Dad and we had an old, rusty, Ben Franklin stove in which we burned soggy wood. Dad was traditional when it comes to underwear, meaning twenty-year old boxer shorts with polka-dots. They were always good for another year, at least according to Dad. Early the next morning, I had a vision. It was a startling one, particularly early in the morning when you first wake up: someone struggling to pull women's nylons over vintage boxer shorts. My Olympus film camera was close at hand, right on top of my backpack. My right hand deftly reached for the camera, but Dad spotted my nefarious maneuver. I've never seen a seventy year old man move so fast before or since. Though this unusual, somewhat ghastly vision did not change my views on heaven, it was quite sufficient evidence to me that hell was indeed a possibility. Up until just a few months ago, Dad was extremely active. In 2013, we took a trip to South Africa and it was a fabulous one. When we got back, Dad remarked that it was the best trip he had ever been on in his life. It was a dandy, to be sure. Dad deeply loved a great many people throughout his life. In recent years, he was fortunate to have a particularly wonderful and helpful neighbor, Herb Coleman. Herbie and his wife Maxine lived right across the street from Mom and Dad and was a great friend to them both. Dad loved Herbie. While Dad was not well on Christmas Eve, he had a wonderful Christmas. While still fragile, we had a good visit the day after Christmas and after spending time with Mom and Dad then, Dad and I talked several times later on in the day and evening. His last words to me late Friday were, "See you tomorrow." However, unexpectedly, at around 3:00 AM or so Saturday, he was gone. Dad never gave up, never stopped living, but his body finally just wore out. In fact, after rehab, we had already scheduled a visit to Mayo Clinic for a full assessment next month. Yes, my father has died. We have all lost people that we truly love and it is always quite sad. It is not all sadness, however, and sadness is not the most prominent feeling. It certainly is not the only feeling that I have, far from it. The most powerful feeling that I have is not sadness, it is gratefulness. For those who knew and loved my father, there is overwhelming gratefulness. It is a time not strictly for feeling loss, but more for thanking God that Duane Earl Wakeman lived in the first place. Copyright 2015, 2016 by Randy Wakeman. All rights reserved.